For the first time, astronomers have seen a dusty disk of material around a young star fragmenting into a multiple-star system. Scientists had suspected such a process, caused by gravitational instability, was at work, but new observations with the Atacama Large Millimeter/submillimeter Array (ALMA) and the Karl G. Jansky Very Large Array (VLA) revealed the process in action. “This new work directly supports the conclusion that there are two mechanisms that produce multiple star systems — fragmentation of circumstellar disks, such as we see here, and fragmentation of the larger cloud of gas and dust from which young stars are formed,” said John Tobin, of the University of Oklahoma and Leiden Observatory in the Netherlands. Stars form in giant clouds of gas and dust, when the tenuous material in the clouds collapses gravitationally into denser cores that begin to draw additional material inward. The infalling material forms a rotating disk around the young star. Eventually, the young star gathers enough mass to create the temperatures and pressures at its center that will trigger thermonuclear reactions. Previous studies had indicated that multiple star systems tend to have companion stars either relatively close, within about 500 times the Earth-Sun distance, or significantly farther apart, more than 1,000 times that distance. Astronomers concluded that the differences in distance result from different formation mechanisms. The more widely-separated systems, they said, are formed when the larger cloud fragments through turbulence, and recent observations have supported that idea. The closer systems were thought to result from fragmentation of the smaller disk surrounding a young protostar, but that conclusion was based principally on the relative proximity of the companion stars. “Now, we’ve seen this disk fragmentation at work,” Tobin said. Tobin, Kaitlin Kratter of the University of Arizona, and their colleagues used ALMA and the VLA to study a young triple-star system called L1448 IRS3B, located in a cloud of gas in the constellation Perseus, some 750 light-years from Earth. The most central of the young stars is separated from the other two by 61 and 183 times the Earth-Sun distance. 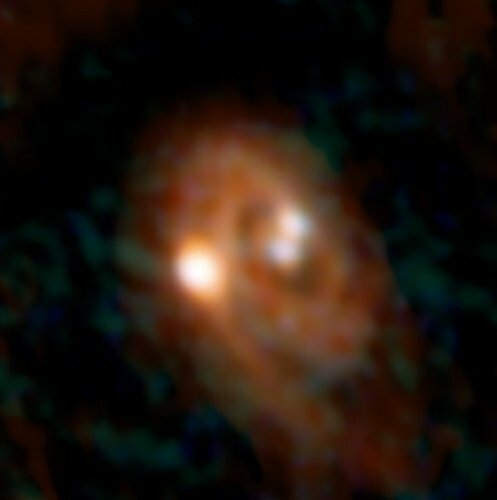 All three are surrounded by a disk of material that ALMA revealed to have spiral structure, a feature that, the astronomers said, indicates instability in the disk. “This whole system probably is less than 150,000 years old.” Kratter said. “Our analysis indicates that the disk is unstable, and the most widely separated of the three protostars may have formed only in the past 10,000 to 20,000 years,” she added. The L1448 IRS3B system, the astronomers conclude, provides direct observational evidence that fragmentation in the disk can produce young multiple-star systems very early in their development. “We now expect to find other examples of this process and hope to learn just how much it contributes to the population of multiple stars,” Tobin said. The scientists presented their findings in the October 27 edition of the journal Nature. ALMA is a partnership of ESO (representing its member states), NSF (USA) and NINS (Japan), together with NRC (Canada), NSC and ASIAA (Taiwan), and KASI (Republic of South Korea), in cooperation with the Republic of Chile. The Joint ALMA Observatory is operated by ESO, AUI/NRAO and NAOJ.